One of the best local multiplayer games on PC just got an update that gives it the potential to be infinitely entertaining. 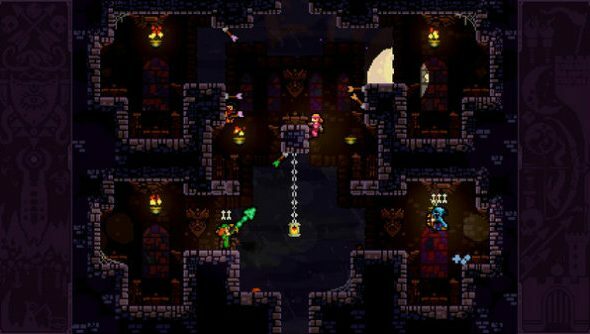 As of yesterday, a level editor has been added to TowerFall, as well as support for mods through the Steam Workshop. The editor allows you to create and share your own personal Versus Towers, and the content comes free. However, the update requires the Dark World Expansion to play. Added the Workshop! Create, share, and play your own custom Towers for Versus mode. Requires the Dark World Expansion. Use Steam Workshop to share and find custom Towers. New stage element available for custom levels: Chalice platforms. New variant added: Infinite Brambles. Players now bounce when they drop orbs by touching them, regardless of where they collided with the orb. Reduced the volume of proximity block sounds. The keyboard config menu now accepts the “OemPipe” key. Keyboard inputs now have numbered names on character select screen (“Keyboard 1”, “Keyboard 2”, etc). The update is available for Windows, Mac and Linux.